November 2018 www.coalage.com 31 handling refuse continued this gallery truss and the two bents sup- porting it. This truss was showing signs of deterioration, and over the years, it had also been impacted in several spots by traffic from the road below. 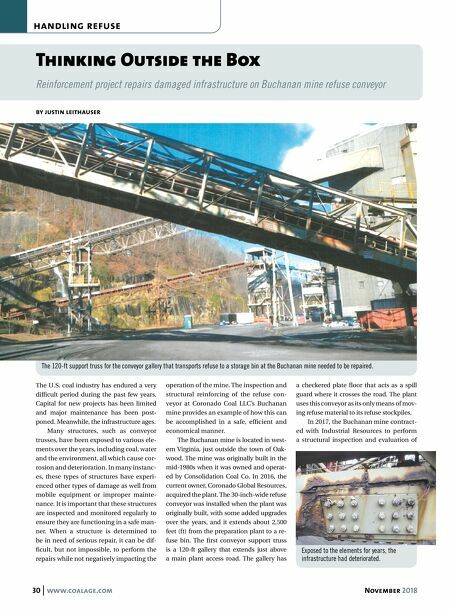 This evaluation identified structural deficiencies that had to be addressed for the long-term operation of the conveyor. In ad- dition to minimizing conveyor downtime, other constraints had to be considered while developing a reinforcing plan that included the roadway below, the active rail- road tracks that run parallel to the roadway, the two 12-in. diameter overland refuse slurry lines that run along the top chord of the truss and maintaining the trusses' cam- ber that was built into the truss when it was originally fabricated 30 years ago. The project team, which included the Buchanan prep plant manager as well as engineer from Industrial Resources, de- veloped and evaluated several conceptual plans. These included replacing the entire truss, replacing pieces of the truss one at a time, installing new supports around the truss, as well as a number of variations of these ideas. Industrial Resources is a turn- key bulk material handling contractor and has been delivering engineering, steel fab- rication, construction and project man- agement services to the mining industry for more than 70 years. The individual from Industrial Re- sources on the project team included professionally licensed structural and mechanical engineers as well as an expe- rienced construction team in safety, steel erection and scheduling. 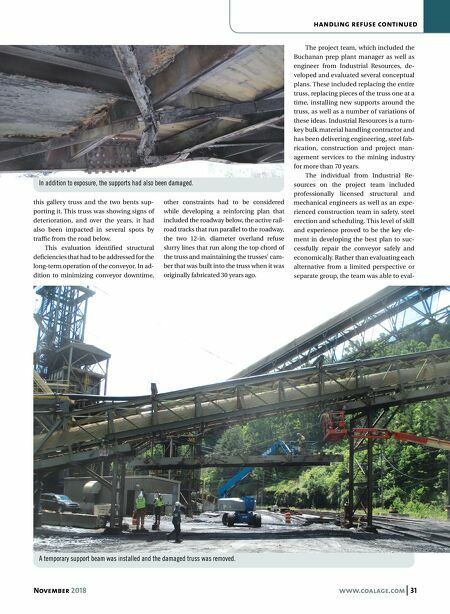 This level of skill and experience proved to be the key ele- ment in developing the best plan to suc- cessfully repair the conveyor safely and economically. Rather than evaluating each alternative from a limited perspective or separate group, the team was able to eval- In addition to exposure, the supports had also been damaged. A temporary support beam was installed and the damaged truss was removed.